We are in full swing with this year’s Tampa Bay tarpon season. For the most part the bite has been awesome! We’ve been averaging 5-7 tarpon a day in the 80-150lb range but we’ve had days of up to 16 hookups! Some days have been slower but over all, the tarpon fishing has been nothing short of awesome. This is trophy fishing at it’s best! The average fish we’ve brought boat side is 100-120lbs with some reaching the 175lb mark. You better eat your Wheaties before you go tarpon fishing in Tampa Bay. You’re not always going to hook 10 monsters because you might spend the best part of the bite fighting a giant tarpon for over an hour! If you just wanted to hook a ton of fish, then you’d want to hook a fish and fight him for 5 minutes, break him off and go back and hook another while the bite is on. That’s how you get double digit days. Tarpon fight so hard that I had two clients this week call the charter off early after fighting a few as they said they “couldn’t take any more”! This truly is a fight of a lifetime and one that you’ll tell your grandkids about. 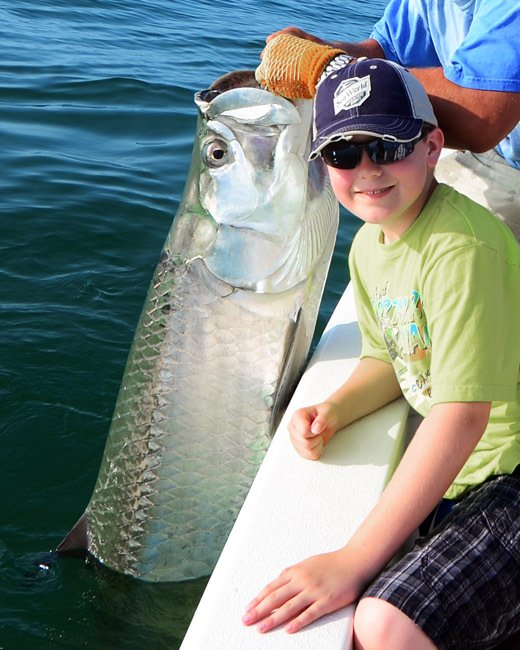 Some of this week’s highlights were 11 year old Wyatt hooking 3 tarpon and landing one all by himself and New York Jet’s tight end, Dustin Keller getting his first 100lb tarpon to the boat. We also had one day where we hooked 16 tarpon and landed 5 of them in less than 6 hours. The great bite has been early in the morning. We’re getting on the fish just as the sun is rising and that’s equated to at least two bites a day before 7:45am. The we have to work a little more to get the rest of the bites but the hard work has paid off. The early bite has been on crabs and the bites later in the day have come on cut threadfins. June is pretty well booked up but July offers some of the best tarpon fishing of the year here and there are several dates still open. So, if you want to land a fish of a lifetime, July offers plenty of opportunities. Just give me a call to get hooked up!